Home > Used Vehicles > 2017 Mitsubishi RVR GT,AWD,LEATHER,SUNROOF,BLUETOOTH,BACK UP CAMERA,AIR,TILT,CRUISE,PW,PL!!!!!! 2017 Mitsubishi RVR GT,AWD,LEATHER,SUNROOF,BLUETOOTH,BACK UP CAMERA,AIR,TILT,CRUISE,PW,PL!!!!!! Hot Deal! We've marked this unit down $1450 from its regular price of $27900. This 2017 Mitsubishi RVR is for sale today in Edmonton. The elegant, yet assertive exterior of this Mitsubishi RVR makes for an engaging and eye-catching design. Far from being just another crossover, this RVR makes a stylish statement while delivering versatility and sound handling. It beckons to be driven with a highly spirited power plant which balances power and fuel efficiency. 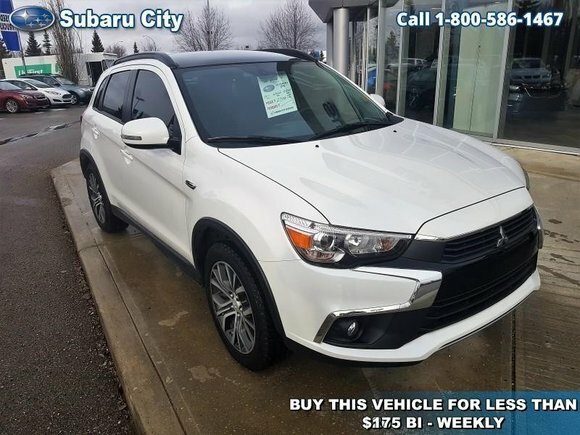 Perfect to navigate the fast-paced and ever-changing avenues of urban living and solid enough to tame the wildest shopping excursion, this Mitsubishi RVR is ready to impress you. This low mileage SUV has just 18450 kms. It's diamond white pearl in colour and is completely accident free based on the CARFAX Report. It has an automatic transmission and is powered by a 2.4L I4 16V MPFI DOHC engine. It has some remaining factory warranty for added peace of mind. Buy this vehicle now for the lowest bi-weekly payment of $173.32 with $2860 down for 84 months @ 5.99% APR O.A.C. ( taxes included, $790 Administration and Secure Ride included / Total cost of borrowing $5802 ). See dealer for details. Want to try the 2017 Mitsubishi RVR GT?